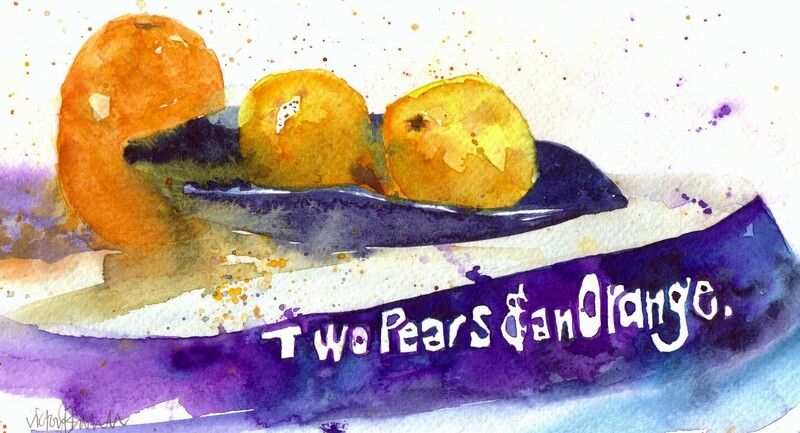 ← ….. My New Diary …..
… 2 pears,an orange … & a huge Get Well ….. to Laurel …..
….. I know some of you also follow Laurels blog ” Rockin’ the Purple” and may have noticed Laurel has been quiet now since last July ! I heard today that Laurel has had a very rough time and is currently unable to communicate by blog/emails …. …. so, I am writing a snail-mail letter to Laurel and if anyone has a (short) message for me to include, please let me know 🙂 (email me at : Neowatercolour@aol.com) ….. This entry was posted in Art, Sheffield, Sheffield - watercolours, UK and tagged Get Well, Laurel, Rockin the Purple. Bookmark the permalink. 3 Responses to … 2 pears,an orange … & a huge Get Well ….. to Laurel …..
Oranges and pears – a health-giving combination I am sure. They certainly are a cheerful sight. You have rocked the purple a bit yourself V! I hope Laurel catches your vibrant vibe. Good for you! And best wishes to Laurel.